Evolution of the Earth focuses on the formation of Earth. Topics include the differention of the core, mantle and crust; the formation of the ocean basins and continents; outgassing and volcanism; the initiation of plate tectonics, the origin and persistence of Earth's magnetic field; the growth of the inner core; changes in mantle convection through time; and the impact of life on the planet. 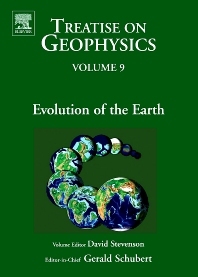 The volume takes an interdisciplinary viewpoint that emphasizes the interplay of geophysics, other aspects of earth science and biological evolution. Some outstanding questions are identified and debated. Geoscientists, paleontologists, evolutionary biologists, and other researchers and students with an interest in the geological and biological history of planet Earth. 9.01 Earth Formation and Evolution, 9.02 The Composition and Major Reservoirs of the Earth Around the Time of the Moon-Forming Giant Impact, 9.03 Formation of Earth’s Core, 9.04 Magma Oceans and Primordial Mantle Differentiation, 9.05 Water, the Solid Earth, and the Atmosphere: The Genesis and Effects of a Wet Surface on a Mostly Dry Planet, 9.06 Plate Tectonics through Time, 9.07 Mechanisms of Continental Crust Growth, 9.08 Thermal Evolution of the Mantle, 9.09 Thermal and Compositional Evolution of the Core, 9.10 History of Earth Rotation, 9.11 Coevolution of Life and Earth.